Osteoblasts are bone-forming cells that play essential roles in skeletal development, remodeling, and homeostasis. In the osteoblast developmental program, runt-related transcription factor 2 (RUNX2) forms a complex with the Hippo signaling effector TAZ. Loss-of-function mutations in RUNX2 repress osteoblast differentiation, impair bone formation, and are associated with the congenital bone disorder cleidocranial dysplasia (CCD). Though the RUNX2-TAZ complex appears to exert critical control over osteoblast lineage commitment, the mechanisms that regulate TAZ are not known. A recent study by Matsumoto et al. identified the ubiquitin ligase RNF146 as a critical control point for osteoclastogenesis through its promotion of Wnt/β-catenin signaling. This week in the JCI, a second study by Matsumoto et al. links RNF146’s regulation of the Wnt/β-catenin pathway to downstream effects on TAZ expression. Selective ablation of Rnf146 in osterix-Cre mice led to a CCD-like phenotype, characterized by defective bone development and osteopenia. RNF146-deficient mice also displayed increases in bone marrow fat stores as well as glucose intolerance, substantiating its role in osteoblast lineage commitment. Further investigation determined that RNF146 loss attenuated β-catenin and led to downregulation of FGF18, which in turn reduced TAZ expression. In support of this mechanism, ectopic expression of FGF18 in RNF146-deficient mice rescued defective osteoblast proliferation. 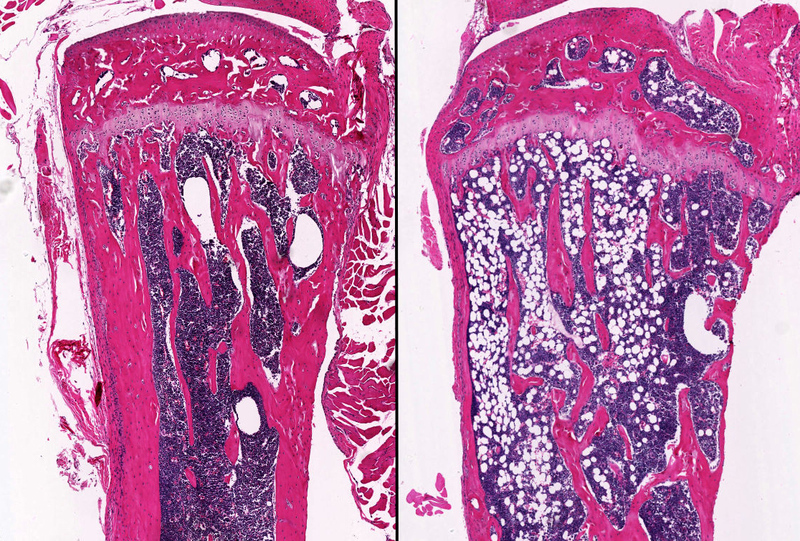 The featured images are H&E stains showing fat accumulation in the bone marrow of control Rnf146fl/fl mice (left) and conditional RNF146-deficient mice (right). The increase in unstained fat area in RNF146-deficient mice supports RNF146’s function as a fate-determining factor in the Wnt/β-catenin pathway that promotes osteoblastogenesis while suppressing adipogenesis. Citation Information: J Clin Invest. 2017;127(7):2612-2625. https://doi.org/10.1172/JCI92233. Cleidocranial dysplasia (CCD) is an autosomal dominant human disorder characterized by abnormal bone development that is mainly due to defective intramembranous bone formation by osteoblasts. Here, we describe a mouse strain lacking the E3 ubiquitin ligase RNF146 that shows phenotypic similarities to CCD. Loss of RNF146 stabilized its substrate AXIN1, leading to impairment of WNT3a-induced β-catenin activation and reduced Fgf18 expression in osteoblasts. We show that FGF18 induces transcriptional coactivator with PDZ-binding motif (TAZ) expression, which is required for osteoblast proliferation and differentiation through transcriptional enhancer associate domain (TEAD) and runt-related transcription factor 2 (RUNX2) transcription factors, respectively. Finally, we demonstrate that adipogenesis is enhanced in Rnf146–/– mouse embryonic fibroblasts. Moreover, mice with loss of RNF146 within the osteoblast lineage had increased fat stores and were glucose intolerant with severe osteopenia because of defective osteoblastogenesis and subsequent impaired osteocalcin production. These findings indicate that RNF146 is required to coordinate β-catenin signaling within the osteoblast lineage during embryonic and postnatal bone development.